Future business leaders pitched ideas to Plymouth businessman Chris Dawson for a competition to mark the launch of his 100th store. Budding business leaders have worked with one of Plymouth’s most successful entrepreneurs on a special competition to mark the opening of his 100th store. Chris Dawson, founder and owner of The Range, agreed to team up with the Futures Entrepreneurship Centre at Plymouth University to judge a project designed to inspire its students. The competition was open to those participating in Futures’ BETA Enterprise Programme, with the students having to write a one-page business plan based on a product or service they have been developing. 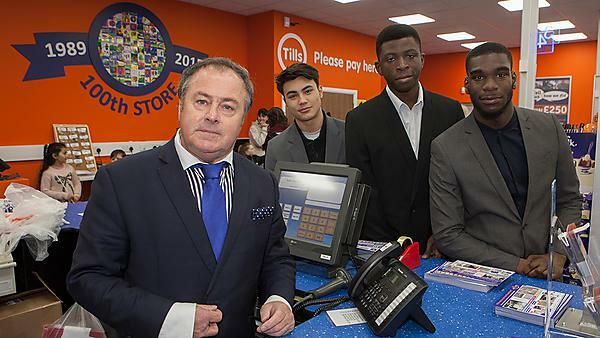 The top three students – Gideon Asamoah, William Cowie and Feyikunmi Ogunyeye – had to give a presentation of their plans to Mr Dawson at his company’s headquarters, with all three invited to the opening of The Range’s new store in Peverell, Plymouth, where he presented winner Gideon Asamoah with his prize. Gideon, a BSc (Hons) Economics with Politics undergraduate, wrote the business plan for a personalised app or website designed to make event planning easier and more efficient, wherever you are in the UK. The BETA project initially provided a number of students with a grant of £1,500 to take an idea and explore avenues through which they might create their own small business. As well as the financial support, they receive individual mentoring to help them recognise and overcome potential pitfalls and develop enterprises with the ability to succeed and grow. It is one of many initiatives created by the Futures Entrepreneurship Centre which aims to provide a creative and social space where entrepreneurship and social enterprise can flourish. And in September 2015, it will launch a two-year intensive degree course – BSc (Hons) Business Enterprise and Entrepreneurship – focussed on giving graduates the expertise and experience with which to create and grow their own companies, or work effectively in larger organisations.